Twenty.five.weeks.pregnant...is this really me we are talking about?! I remember when we first found out we were pregnant and thinking how FAR away the 100 day countdown period seemed. It felt like I had all the time in the world to prepare and I figured I would be semi-miserable with only 100 days left (wrong.) And NOW...well here we are...105 days away from our due date! I know 20 weeks is a big milestone, but I've really felt like hitting 25 weeks has been even bigger for me (literally) with so many changes happening, so I think I'm going to switch up this bumpdate edition and do things a little differently. I want to share some highlights and what I've thought about pregnancy so far! 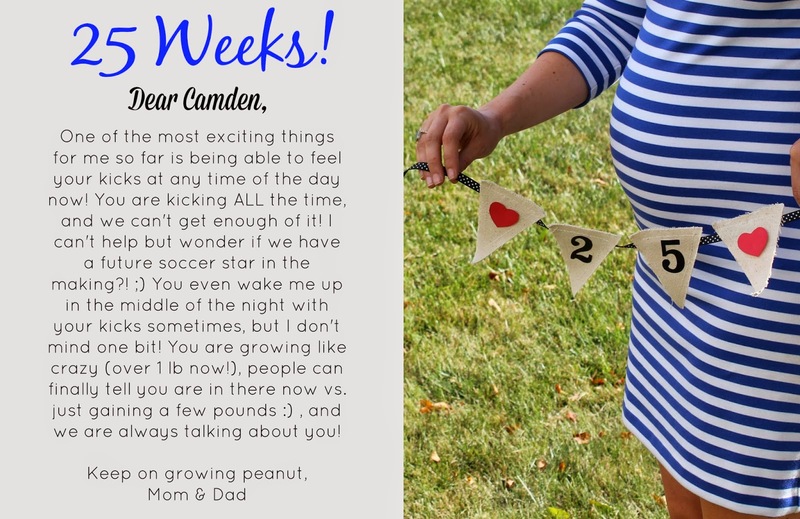 -Camden is now the size of a cauliflower and weighs about 1.5 to 2.5 pounds! He is learning to distinguish right side up from upside down, and is growing more hair too. -He has been really active now for a couple weeks and I can feel him in the middle of the night, in the morning, at lunch, after work, and after dinner. So basically, all the time. Billy, too! He will watch my stomach move from side to side and just laughs. :) We even played our first little "game" together...he kicked in one spot, I pressed gently back in the same spot, he kicked again, I pressed again, he kicked back. He did it about 4 or 5 times and that was just so neat. I feel like this was the point that I have been waiting for my whole pregnancy and now it's here! It's as awesome as I expected it to be. -After eating a really late dinner one night last week, the next day I was really sick and after a phone call with one of the nurses found out that I was having muscle contractions/spasms (don't worry-not the labor kind) at the top of my stomach, due to food just not sitting well with me. The spasms would come and go every 20 minutes or so at first (with sharp, shooting pains), but then throughout the day they became less often. It was a pretty rough day and I didn't feel like myself for about 2-3 days, but I got through it! I actually lost 1 lb-1.5 lbs (probably due to this and my diet being more bland), which makes me up a total of about 14 pounds I think? -My workouts have been better lately than prior weeks! My legs have been getting tired really easily, but overall I'm really happy, and surprised, with how strong and in shape I still feel. I'm running 3 miles about 3-4 times a week, mixed in with some squats and arm exercises. Spin classes on Monday's too. I think I had this idea in my head before actually becoming pregnant that I wouldn't feel good working out by this point, or it would be so hard, and that definitely hasn't been the case. So thankful for that! -Said hello to back pain (comes and goes-right now it's gone so that's nice) and to the linea nigra recently. You know, that dark vertical line down my belly! It is really faint right now, but it's still noticeable to me. -Cooking sausage, or even just smelling it, makes me literally want to hurl. I have to leave the room so that I don't. :) Same goes with cigarette smoke...I can smell it from 3 miles away and it bothers me so much. Gross. Just gross. -DQ S'mores blizzards. Someone tell me to put down the spoon...or don't. That good. -I found two really great maternity clothes for this fall/winter last week. Probably my favorite two so far! This dress and a fleece sweatshirt, that I can't find online right now. It's from Old Navy and is so incredibly soft. -The nursery is really starting to come together! The crib is up (love it! ), dresser, rug, and decorative pieces! The side table is being delivered today, so really all we are waiting on is the glider (you can see which one we got here!). I've found some of the most adorable knick knacks that go with our "theme" (that I'm keeping a secret until the reveal) that are now sitting out! I'm holding off on putting anything on the walls until we get our chair and until I can make my mind up more about what I want on them exactly. Getting anxious to share the space with you all, that's for sure! -Sleeping really great still, if I have my Bump Nest. I tried to sleep without it one night and that didn't go so well, so that bad boy will definitely be packed in our carry-on to go to Florida with us!! I have noticed my sides are getting sore from always switching back and forth. Sometimes Cam will be a kicking machine in the middle of the night and wake me up, but I think it's hilarious and I'll fall right back to sleep! Whoa, that was a lot of pregnancy talk goin' on. Whoever has actually made it to the end of this post, you're a trooper and thank you!! Pregnancy has totally exceeded my expectations, even after all these new symptoms this week. I've told some of my friends that I think I built up this idea in my head that I wouldn't enjoy it or that I wouldn't be able to do a lot (maybe because of some of the stories I've heard from friends, etc) but that's simply not true. Or maybe I was just scared of the unknown? Who knows, but I'm one pleasantly surprised girl over here. Alright....enough from me, happy hump day everyone! I love that baby book! So cute to see you documenting everything along the way. 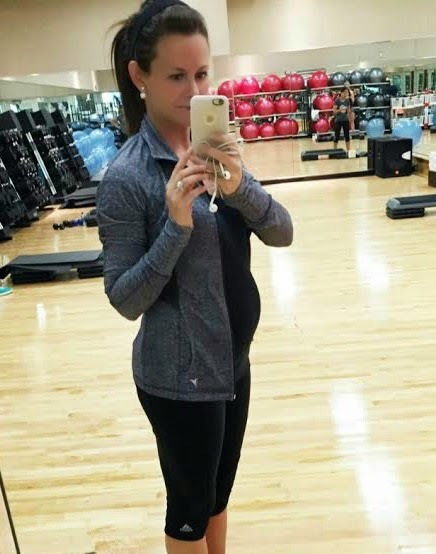 And that gym picture with your bump is just the best! So happy for you! 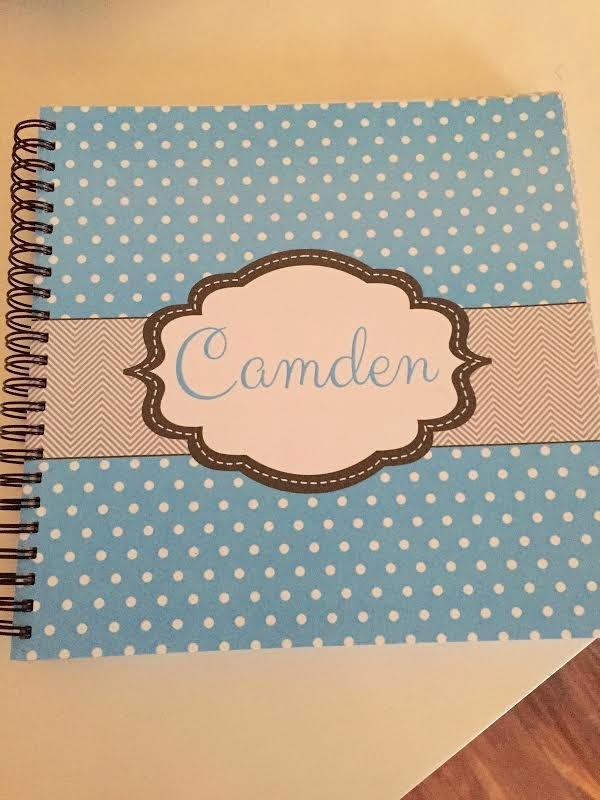 Love your baby book and can't wait to see the nursery! I wish I could say we have started on our baby girl's but her big brother is still using it until we get his big boy room ready. Maybe I won't still be working on it on my due date! :) Not much longer now...especially when you factor in all of the holidays coming up! You look great girl! :) I cannot believe you're at 25 weeks already, I feel like we just found out!! Where did you get that baby book? It's adorable! Oops-linked to it right below the picture, is what I meant. Oh, totally missed that - thank you! Ah! Really?! Someone is out there that isn't pregnant and enjoys reading them? I'm sure you're the minority haha no but really, I appreciate hearing that!! :) Thank you Amanda! I love reading your blog, and especially your bump updates (I'm 2 weeks behind you!). Great job keeping up with your work outs! People think I am crazy that I still run and lift 6 days a week, but it honestly makes me feel so much better! And trust me, it will help make the baby weight come off some much more easily (This is my second baby so it worked great the first time around!). Glad you are still feeling great!!!! Hey girl! Thank you! Not crazy at all-why stop when it makes you feel so good?! Some days the gym can instantly turn around my mood so I KNOW it's better for me (and baby!) that I go! :) Thank you for following along with me on these lengthy updates! You look great Katie!! & that is so awesome that you are still running & keeping up with your workouts like you have been!! It's been on my intentional list but, I have failed at that lately! Cannot wait to see Camden's room!! It's one of the most exciting things!! wow such a cute look, that the coat is perfect!